Funeral Hearts by Sarah Coxon Floral Design Norfolk. 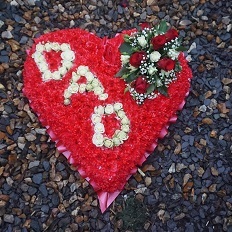 The heart flower tribute is a popular choice as there are a number of options to choose from solid hearts, open hearts and also double hearts. Traditionally there are two main designs to choose, either the traditional based heart or a mixed flower heart tribute. The Based design is based in white Chrysanthemums, and is edged in hand pleated ribbon in a colour co-ordinating waterproof ribbon. The spray of flowers on top of the heart is raised above the Chrysanthemums and includes a beautiful selection of Roses, spray Carnations and other flowers to complement the design. It is possible to change the white Chrysanthemums for yellow or pink flowers. Please call Sarah on 01328 829781 if you would prefer to order your funeral tribute over the phone.